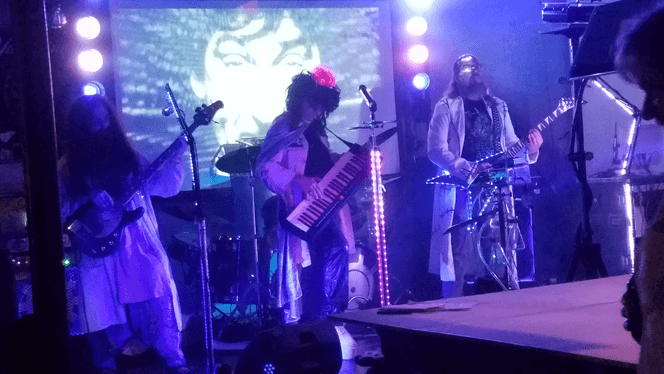 After years of not keeping up with my favorite evil scientist supervillain band, I was, of course, elated to learn that Consortium of Genius (COG) was playing at Bad Wolf Bar And Grill. 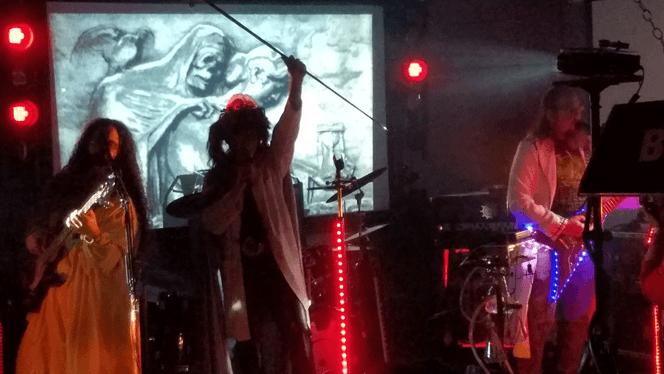 These guys have always gone all out in their shows with projections, lighting effects, and sometimes smoke machines, as well as the elaborately developed super villain characters that are COG on and off stage. 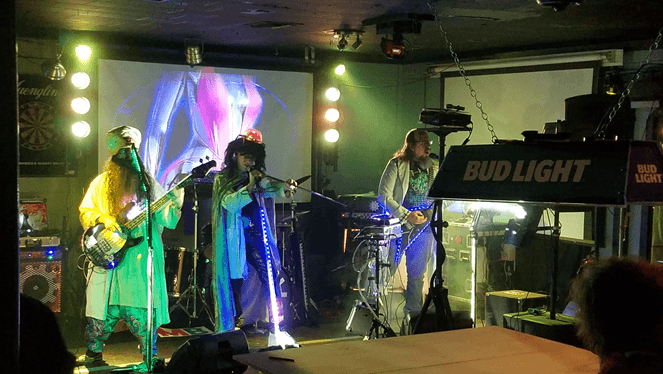 The band is led By Dr. Milo Thaddeus Pinkerton III and throughout the years has had many incredibly talented, colorful, engaging enigmas who have put in some great tunes and of course diabolical delights over the years. After some brief banter with Pinkerton after all these years, the show begins. COG, despite Dr. Pinkerton’s opinion of Drumbot, the band is lucky to have him; good drummers are hard to find for us “mere humans” as Pinkerton might say. During another GOG favorite, Mallet Of Metal, COG, ever for audience participation, handed three audience volunteers prop weapons with which to spar it out during the number. At the end of the song, one was named as victorious. This unique band is fun in every way and certainly something to see. 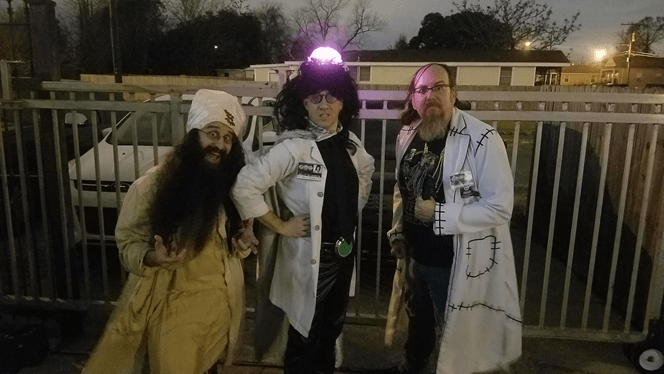 After the set, I sat down with Dr. Pinkerton and Doctor Z for a quick interview before they had to return to their scheming in the laboratory. Margaret: So how long has COG been a band? M: What led to the idea of a mad scientist-themed band? Dr. Z: Because we’re mad scientists! Dr. Pinkerton: And our education at Miskatonic University. M: Does Drumbot have any profound insights to share? Dr. Pinkerton: Does he have what?! Insights? Dr. Pinkerton: Well, he hates humanity. I know that. Of course, I programmed him to do so… but he must obey my commands or else I will unplug him. Dr. Z: But sometimes he does try to kill us, so we do have to be careful. Dr. Pinkerton: Yes, of course. Then that point I have to reprogram him. M: Is that typical of drummers? Dr. Pinkerton: Yes, yes, yes. Drummers must be kept in line… like most machines. Dr. Z: One, two, three, four. Dr. Pinkerton: Yes. Yes. Very linear. Dr. Z: Right on the beat! Dr. Pinkerton: Like an atomic-powered clock… but evil. M: Are there any differences worth noting between the first iteration of COG and COG today? Dr. Pinkerton: COG is eternal. Scientists may come and go, but genius remains forever! M: I hear that. Who are some of your favorite consortium characters from past and present? Dr. Pinkerton: Me… myself… I… Dr. Milo Thaddeus Pinkerton III. Dr. Pinkerton: And yes Filbert, that idiot… That idiot! If he were here, I’d smack him about the face, he’s probably very lucky that he’s not. Dr. Pinkerton: Ah yes yes, my original colleagues Dr. Wissenschaft and Dr. Smerlington, without whom we would not be here tonight! M: Absolutely, how would you describe a day in the life of COG? Dr. Pinkerton: I wake up, I have cereal and MILK! Milk is a vital part of the breakfast of every supervillain. It contains the calcium that you need to take over the world. I have TWO helpings of milk with every helping of cereal! Dr. Z: I just like it in ice cream. Dr. Pinkerton: Yes, ice cream, which is also evil and contains milk and there you have it. M: Expense aside, what would be the ultimate technological advancement for future COG shows? Dr. Z: Just like the P-funk! Dr. Pinkerton: Yes. A flying spaceship… you know, at some point we ARE going to have to irradiate the surface of the earth. So we are constructing a giant guitar-shaped orbiting station, high above the atmosphere right above Louisiana. And then followed by that I shall install a third brain upon my cranium, mark my words, it’ll happen. Dr. Pinkerton: Silence! Your attempts at humor will be met with force! 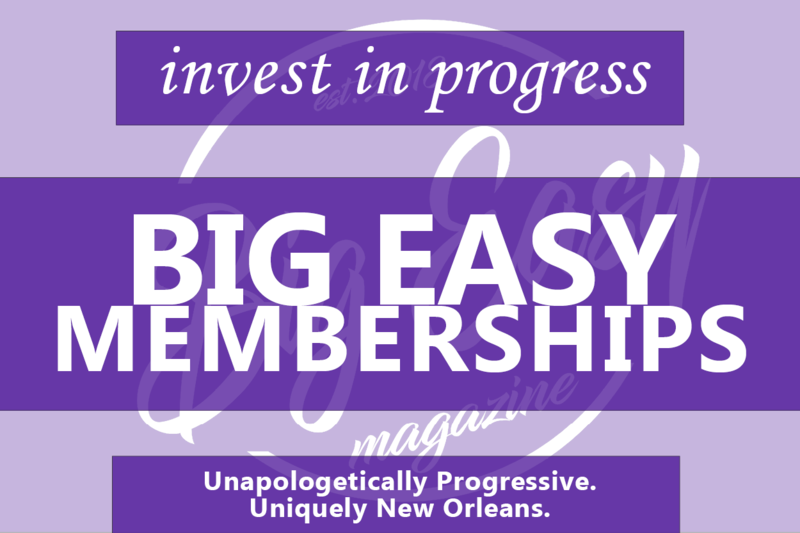 M: In closing is there anything you would like to say to Big Easy or potential future COG fans? Dr. Pinkerton: You will all bow to me… whether you like it or love it. Also, you should report to www.consortiumofgenius.com as soon as possible and memorize every lyric that you see there. Look back on our great retinue of history, all our lessons and take them to heart, for soon you, will be SCREAMING MY NAME as you bow to ME. Dr. Z: And be sure to watch the old TV Show it is lots of fun. M: Thank you so much for sharing your insights, music, and hilarity. Dr. Pinkerton: Oh yes! 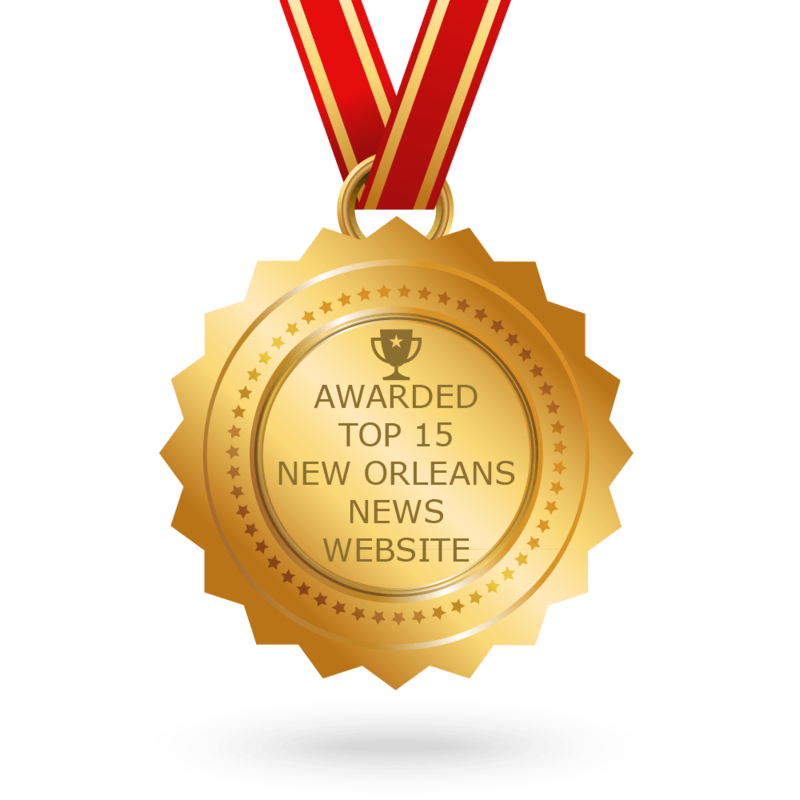 Although I never joke for I AM Dr. Milo T Pinkerton… THE THIRD and you are my audience forever! Goodnight. I again thanked Pinkerton and the rest of COG for a great show and stuck around the bar, which is a very cool spot, I’m learning and caught some of the cover band that followed, The Nobody’s who brought the audience back to some of their rock favorites of the 90s, my high school years as well as apparently those of many people in attendance. So, until next time COG, keep rocking those villainous vibes and tunes!